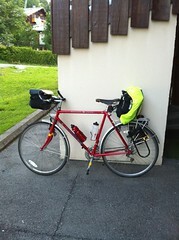 With much trepidation and a loaded up bike I left my apartment in Les Gets at dawn break (06.30) to try and beat the high temperatures (30 deg) today. I made it to Evian by 8.30 getting frozen in the process! as its mainly downhill in a sun shaded valley. I soon warmed up on the road to Martigny stopping for a 10quid sandwich at St Maurice and arriving in Martigny at 2pm after a 67mile ride. Once in Martigny I decided to take Michaels advice and get the trains upto Andermatt where the Rhine Radweg starts. So 47 pounds and three hours later that’s where I arrived. It has to be said Switzerland is expensive but then again you get something for your money! Superb cycle lanes on the roads and along The Rhone, the railway is clean punctual with special places for the bikes and the ride from Brig to Andermatt is stupendous on a narrow gauge with new track viaducts and tunnels. Tomorrow starts with a mega 600 metre climb up the Oberalp pass to Sedrun after that its mainly downhill and 1000miles to Holland! I am sure you know where yo are going Geoff.. just looked at your other planned map.. seems a bit different to this one! !